Its just a thought but I'm beginning to wonder if the person (whoever it may have been) was even actually at the house? I say this because as we all know the callers version of the CPR allegedly being administered by Murray was SO waaaaaay of normal procedure could it be that he was rehearsed before the event but made a couple of vital errors when he 'went live' so to speak?? But perhaps he was unprepared for the question of WHERE the patient actually was situated at that exact moment in time? Now as a nurse MY first thought would be to say the patient was on a hard surface (if I was in that situation), but a layperson would naturally assume he would be on the bed right? After all thats how it is on ER and any other medical drama. But thats because we have very firm mattresses on the beds in hospitals for precisely that reason! At home the immediate reaction would be to get that person on the godamn floor!!! Maybe I'm way off but even as a 1st year nurse I knew resus back to front so there is no way on Gods earth if a cardiologist were present with an unresponsive patient (putting aside that the description of Michael did NOT adhere to a cardiac event as he was said to be warm AND CPR would NOT have been commenced on a patient with a pulse however thready or weak) he would have been pumping his chest allowing the soft mattress to completely counter his efforts. You know what this is the key to the whole thing. Yes theres 1001 mistakes in this whole affiar but they couldnt even get the basic first step right. Cardiologists are at the very pinicle of the profession, treaining for many many years. He wasnt even a consultant in another field. He is a bloody HEART expert!!!! Aaaaaaagh it drives me mad that the media reported on this but have dusted it off as MJ having a dodgy physician or something. A Cardiologist? Not knowing how to optomise a patients chance of survival while in cardiac arrest? Performing CPR on said patient while patient still has a pulse? Presuming cardiac arrest when MJ was not cold and clammy? C'mon. DOES NOT HAPPEN! (I'm not shouting by the way but damn this is frustrating stuff and I need to emphasise my point here). Think I've strayed from my original point here but this is the most ridiculous situation of them all IMO. If rthey were gonna pull this thing off they needed to get the basics right. I hope to God MJ is alive and well because if his DR really was that inept (which I doubt), it's terrifying to think of it. Re: Theory on that call! If he still had a pulse, but not breathing (as they first said) what would have been the procedure? Ventilation? Can you help me to clear up this point? Because I'm starting to think that maybe they said later that "he was already dead" trying to justify the wrong procedures that had been reported...? IDK, just a thought. And taking 30 minutes to call 911 is also a wrong procedure, isn't it? 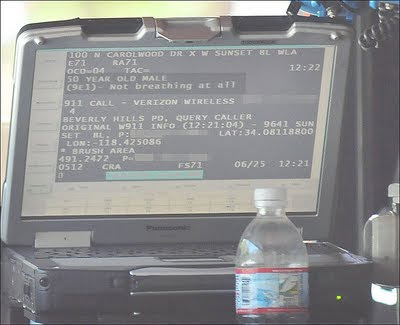 It means that all the reported details about the call, the CPR and the doctor don't make sense at all. princesspea161 wrote: He is a bloody HEART expert!!!! Melanie, this szene has been chosen on purpose. Grace I'm not sure what you mean??? Artificial resps can prevent brain damage once the body is capable of circulating oxygen independently. As for it taking 30 mins to dial 911 thats pure lunacy!! The paramedics have essential equipment on board that will maximise the patients chances of survival and usually any prolonged delay in such circumstances would be viewed as highly suspicious. Lets face it, if we were in that situation and it took US 30 minutes the police would be more than interested to establish exactly why! Also, the staff at UCLA. Where are they? Not even a doctor saying he treated Michael? Hmmmmmmmmmmm. It's just not normal at all. Yeah they guy who made the 911 call is named Alberto Alvarez...same last name as Murray's girlfriend. Coincidence? well said, this point should have every healthcare professional and every medical board crying foul. it's a complete outrage. also on another site they are saying doc murray did not have a valid passport so how the hell was he gonna go to England ,by flapping his arms ? princesspea161 wrote: Grace I'm not sure what you mean??? Thank you for clearing up. Now this CPR/doctor/911 story sounds even more unreal and suspicious to me. As the complete day was so wrong from noon to afternoon and everything was staged, faked or modified, I do not break my head anymore over any medical "how to" that was not applied. It just does not matter for two reasons: 1) we will never know whether there were the events happening that we were told of and 2) the result does not change - MJ is "officially" dead for at least 95% of mankind and he wished to be dead so I respect his wish. I believe that he is alive and well but for the world he's dead and gone. Red carpet, heart, red roses - it's all about L.O.V.E. and Michael showed it so clearly to us - no more question necessary from my part. pulse in a guest bedroom. finally died after being dead. tour. He was also angry about it and cried himself to sleep. And it just continues like this in this week's tabloids. Lies, lies, lies. I never listened to them, I never will. I have a question. If there were oxygen tanks upstairs, as was reported, would it have made sense to administer oxygen to a person who had a pulse but was not breathing? I'm not in the medical field, so I'm just wondering, if that is something that should have been done. It was never said whether it was or not. Great points, princesspea161! Thanks for that info based on your knowledge of CPR etc. That was very helpful. To me, it's pretty clear: Either this is all a giant hoax, or MJ was murdered. Of course I lean toward the hoax, but I'm just saying...that's the only other explanation that I think is possible. I just don't see how Murry could have been such a complete idiot and have any medical licenses at all. It makes no sense! So I don't see how, if MJ turns out to be really gone, it could possibly have been just an accident. It would have to be a far more sinister plot than we even know. Two years ago my father had a heart attack in front of me. He did not stop breathing and his heart did not stop beating until a minute into the attack... up until this point i did not administer CPR... i have had no official training, it was all reflexive and spontaneous. I also grabbed the phone and called 999 immediately into the attack.. again spontaneous. I knew it was serious and i went into automatic mode. I did not fanny about making calls to other people or doing CPR on my own. When the story first broke this is what made me suspicious straight away as Dr Murrays story does not add up. I know because i have had personal experience. Christiana wrote: Great points, princesspea161! Thanks for that info based on your knowledge of CPR etc. That was very helpful. I don't think (if MJ turns out to be gone) that it was an accident at all. But many people who believe MJ is gone think that Murray was just an idiot. The case hasn't been ruled "murder." It's been ruled "Homicide." They are two different things. Homicide just means death at the hands of another. MJ's family was not around him much. Even Janet and other family members have said they last saw him in May, and that was not at MJ's house. So how would they know what went on with him at his home? If we're talking possible conspiracy here (just throwing things out to answer your questions): Murray knew, the bodyguards probably knew too--and they could have told anyone else who could have been in on a conspiracy. (Let's not forget about the shady Tohme Tohme!) I've read tons of conspiracy scenarios in other MJ fan communities. Believe me, if we find out he is D-E-A-D for a fact, then I will totally believe it was a conspiracy and that he was murdered! SPAKKLE29FUL wrote: also on another site they are saying doc murray did not have a valid passport so how the hell was he gonna go to England ,by flapping his arms ? Rightly said and rightly thought! Thank you for your answers. I agree. If in the end they show us proof that he's really gone I too will believe in a conspiracy. Grace wrote: As the complete day was so wrong from noon to afternoon and everything was staged, faked or modified, I do not break my head anymore over any medical "how to" that was not applied. It just does not matter for two reasons: 1) we will never know whether there were the events happening that we were told of and 2) the result does not change - MJ is "officially" dead for at least 95% of mankind and he wished to be dead so I respect his wish. I believe that he is alive and well but for the world he's dead and gone. Thanks for that I was crying with laughter!! princesspea161 wrote: Its just a thought but I'm beginning to wonder if the person (whoever it may have been) was even actually at the house? If Michael had rheumatism (you may have noticed the swallen finger joints), this disease very likely may also affect organs. In addition he had Lupus which is a autoimmune disease not stopping but returning and equally likely to affect lungs and organs. Grace wrote: If Michael had rheumatism (you may have noticed the swallen finger joints), this disease very likely may also affect organs. Do we know for sure that he Lupus? I've never read anything to confirm that rumor. Apparently it is one of the things Klein said-but it was not in the last autopsy report that came out if I recall correctly. Another thing that bothers me.. i have googled this and read articles...apparently it is physically IMPOSSIBLE to be addicted to Propfol.. it is simply not a drug the body can form an addiction to. So this Dr Murray was "concerned MJ was forming an addiction" to a drug which it is impossible to become addicted to? I havent heard the Lupus thing before either. It would be impossible for me to draw any conclusions about the oxygen, injection marks etc without knowing his full medical history (not bleedin likely). Were they trying to say he was riddled with injection punctures as in him being some kind of junkie???? If they were, all I can say is on TII he did not present at all like he was artificially up or down. He appeared alert, active (not hyper) and very concentrated on his art. I know we only saw a mere snippet but I donr believe anyone has come forward with any decent evidence of him running to the bog every half hour to get jacked up to his eyeballs! Drug abuse makes the abuser very one dimensional = drugs drugs drugs me me me, MJ seemed highly attuned to his team and concerned about creating a perfect show for his fans. He was in tune with other people and the music and just seemed really dedicated and professional throughout. Personally I believe that while he may have been painkiller dependent, it never went to harder drugs. But that is my personal opinion so dont all shout at me or anything. For a man of 50 he was in pretty good shape both physically and mentally. I'm only 34 and I'm already falling to bloody bits!!!! I keep swearing, will I get told off?! It is told on purpose for us to see that this is a Lie!! Just look at the screen! If you look carefully you will see that the sale "Sunset BL" (Sunset Boulevard!) The MJHD forum, is the address of a hotel means that the bodyguard who called, was in a hotel and not at home Michael! It's already been established that the call came from Alberto Alvarez' cell phone. The address on the screen is the Verizon Wireless cell station.